Yesterday was my 27th birthday, and it was a fine one at that. It had been cold lately, but the 27th was nice and warm. It was nice to really feel the sun’s warmth sink into my skin when I went for a walk. It was the first time in a while that I didn’t need a jacket. My birth-minute is 1:27 on 2/27, so I spoke to gem on the phone at that time. After work we went to Polly’s Pies. Because we’ve been watching Pushing Daisies, which often takes place at a pie restaurant called the Pie Hole, I had been craving pie. We split a slice of apple pie with ice cream and cherry pie. Both were delicious! We brought a slice of peach pie home too for another night. At home I took a shower, and that’s when festivities took a slight detour. The shower was clogged. Once that was settled, it was time for part two of the amazing pie night – pizza pie! We headed to Gina’s Pizza, my favorite pizza joint, for a chicken, meatball, roasted pepper, jalepeño, and pineapple pizza! It was delicious. gem got me a gift too. She bought me a box of peanut butter chocolate protein bars and a box of assorted protein bars! It’s kind of sad that this excited me, but it did. There are even a couple flavors in there that I haven’t tried yet, chocolate chip and peanut butter crunch. It was a very nice birthday. This entry was posted in Journal and tagged 27th birthday, birthday, gina's pizza, pie, pizza, polly's pies on February 28, 2013 by TheUser. Following the dysopian future shown in Matched, Crossed explores the fringes of that society. More importantly, it shows what’s outside of that. While it was exciting, a story becomes less dystopian once it’s outside of the society proper. When I discussed Matched, I compared it to other novels in the same genre. The series especially reminded me of The Hunger Games. Fortunately, things deviated. First, there was the secret. I won’t give it away, but it raises the tensions a bit. Second, the ending of Crossed definitely paves the way for Reached, the final book, to be quite exciting (and different)! This entry was posted in Books and Literature and tagged ally condie, book, crossed, dystopia, dystopian, matched, novel, review, sci-fi, science fiction on February 21, 2013 by TheUser. With the sixth episode of the Human Division, Scalzi finally gave me what I really wanted. He showed me the Conclave. While the Back Channel shows humans as well, it really showcases alien members of the Conclave and the Conclave itself as a political unit. More than anything in the Old Man’s War universe, that’s what I wanted to see next, so I was thrilled to find myself before a large political body of the Conclave. The Back Channel raises some tension in the story while reaffirming that while the Conclave might be at odds with the Colonial Union, they’re not villains (at least not to the readers). Without giving anything away, we also see that we still have a missing puzzle piece. This entry was posted in Books and Literature and tagged john scalzi, old man's war, review, sci-fi, science fiction, the back channel, the human division on February 21, 2013 by TheUser. gem had never seen Sin City and wanted to watch it, so I borrowed it from my brother on Sunday. We watched it last night. Wow, I forgot just how good it is! It’s like a dark, film noir playground in which Miller can explore his fantasies. The first thing I notice is how great the casting is. Jessica Alba, Mickey Rourke, and Bruce Willis were all great. I didn’t even notice that Kevin was Elijah Wood, who also did an excellent job, until gem pointed it out to me. I love how the film captures the feeling of a comic book. The stylized use of color to highlight and accentuate was obviously used throughout the film. Even the stark white bandages on Marv’s face stood out from the rest of the scene. I absolutely loved the large, fat drops of white rain on a dark background, coming down almost like a solid sheet. Noir fiction couldn’t be noir without heavy rain, right? I just loved the style. According to Wikipedia, Sin City 2 will be released this coming October. I really need to read those graphic novels. This entry was posted in Comics, Journal, Movies and tagged bruce willis, elijah wood, film, film noir, frank miller, frank miller's sin city, jessica alba, mickey rourke, movie, noir, sin city on February 19, 2013 by TheUser. After having talked about Disneyland earlier today, I realized that I never mentioned World of Color! Obviously I’ve seen them preparing it a long time ago. Having a big, empty, concrete reservoir in the middle of Disney’s California Adventure was quite obvious. However, I never went to see it. I’m not really sure why. A week ago we finally got around to watching it. It was amazing, although that shouldn’t surprise me. We were right in the front but a bit to the right, giving us a great view. The only problem was the temperature. It was freezing. It was freezing in the car with the heat. It was freezing at home. I sort of felt like I couldn’t even heat up the next day! Rather than showing a cohesive story like Fantasmic, World of Color shows various scenes from different Disney properties. It’s a water show featuring fountains, lights, lasers, fire, screens of mist, and video projections. It’s very well done, but I felt like it was missing the classic Disney characters. I love Mickey, and I love seeing him dressed as various personas. I like Goofy, Pluto, and Donald. I want to see more of them, Disney! I’m glad I got to see it before my pass expired! This entry was posted in Events, Journal and tagged california adventure, disney, disney's california adventure, fantasmic, world of color on February 18, 2013 by TheUser. I finished Matched by Ally Condie this morning. Matched is a dystopian teen novel. I caught glimpses of The Giver in it but also a lot of the Hunger Games, which was published two years earlier, as well. Cassia is a member of the Society. Everything seems to be going normally for her when she’s matched for marriage by the Officials just as all married persons are. However, things start to go awry as she develops feelings for another and begins to see the flaws of her Society. Dystopian fiction is always particularly interesting to me. Besides making for entertaining stories, they serve as philosophical thinking points. What if the government could predict things so accurately that they take all the guesswork out of life? Would that be good? What if they could eliminate most suffering, but it came at a cost? I particularly liked seeing what culture was destroyed in this future and what culture was preserved. Compared to other similar works, Matched takes place in a nation that seems a little more connected than most. Family members communicate despite being far away, and people still take trips in planes. In fact, vacations to distant places are even mentioned once. At the same time, things seem even more restricted in Matched than in others of its genre. I could see it almost being accepted more easily by the population than the civilizations in similar novels, which makes it that much more interesting. Luckily for me, the sequel, Crossed, and its sequel, Reached, are already released. I know what’s next for me. This entry was posted in Books and Literature and tagged ally condie, dystopia, dystopian, lois lowry, matched, sci-fi, science fiction, suzanne collins, the giver, the hunger games on February 18, 2013 by TheUser. Our Disneyland Annual Passports are expiring, and thanks to the holiday weekend, Friday was the last day we could go that wasn’t a blockout day. We managed to go the Matterhorn Bobsleds for the first time since it reopened, which was a relief. gem really wanted to go on it last time we were at Disneyland, but they kept closing it temporarily. We also went on Star Tours a number of times. Since it reopened as Star Tours: The Adventures Continue, we always get the same second scene, Naboo. We’d seen both introductions, two of the three first scenes (never having seen Kashyyyk, two of three transmissions (never having seen Yoda), and only Naboo for the final scene. We decided to spend our final time at Disneyland going on Star Tours again and again in an attempt to see the rest. We got to see Kashyyyk, which was cool, and finally, on our last ride, we saw the Death Star in the final scene. No, we never did manage to travel to Coruscant, but this will give me something to do in the future! The fireworks show was cancelled, so we didn’t get to watch that unfortunately. We did, however, get an apple pie caramel apple. 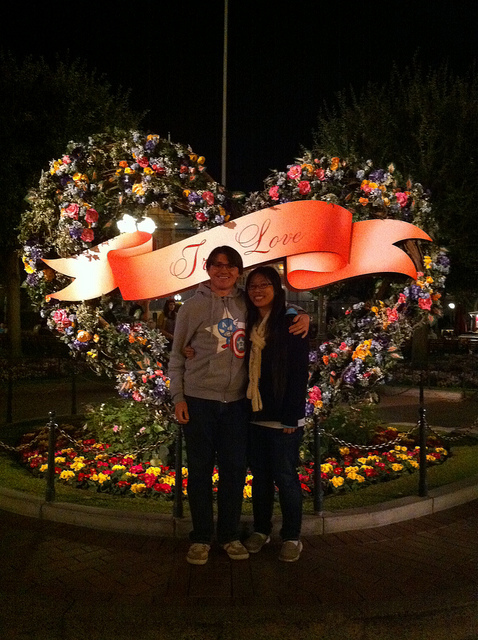 Then, on our way out of the park, we stopped at the front to get our picture in front of the “True Love” sign! I miss my annual passport already. I don’t want to spend the money on it right now, but I doubt I can stay away for too long. This entry was posted in Events, Journal, Photos and Screenshots and tagged annual pass, annual passport, coruscant, death star, disney, disneyland, kashyyyk, matterhorn bobsleds, naboo, sci-fi, science fiction, star tours, star tours: the adventure continues, star wars, true love, valentine's day on February 18, 2013 by TheUser. While the Amazing Spider-Man was quite entertaining, I also found it strangely flawed. Before I even gave it a chance, I have to admit that I was annoyed that it was being rebooted so quickly. It seemed really soon to show Spider-Man’s back story as well. Most people are already very familiar with Spider-Man, so did we really need to learn how he got his powers? However, showing it helps reinforce the idea that this is a reboot. I suppose in this respect there was just no winning. I liked the actors in the Sam Raimi trilogy, especially Tobey Maguire, and I didn’t care for Andrew Garfield’s look at first. Having now seen the movie, his appearance does seem to match the character as he’s written, but he’s not written as I know him. Peter Parker is supposed to be a smart, nerdy kid. He’s an outsider because of that. In the Amazing Spider-Man, Parker is still an outsider, but I don’t really see him acting like a nerdy loser. He seems smart, sure, but he also has the self-centered attitude stereotypical to teenagers. For example, after a teacher tells him not to use his skateboard in the hall, he waits until out of his sight, drops the board, and continues skating. Perhaps things have changed since I was in school already, but weren’t the skaters the cool kids? Peter Parker is definitely a different Peter in this film, but it still works for him. The intelligence is still there, but the nerdiness isn’t as highlighted. As he’s younger in this film as well, it seems only fitting that he’s filled with angst. He’s a rebellious teenager at this point, and it shows. The Lizard was an interesting and memorable villain but not quite as memorable as some from the Raimi trilogy. I didn’t find Sandman or Venom very interesting in Spider-Man 3 (despite really liking Venom), but I still found the Green Goblin and Doctor Octopus more interesting than the Lizard. On a less important note, there’s a scene in which Spider-Man jumps off a balcony without his backpack and later has it. I caught it immediately and have to wonder how no one attached to the film caught it in time to fix it. The security at Oscorp is ridiculous. How they don’t manage to notice Parker going where he shouldn’t seems like flawed writing to me. At first I wanted to say that it also seems unbelievable that Parker would touch the things he did, but I might be projecting values of the Raimi Parker on the new Parker. The film is darker than I’d like Spider-Man to be, but there’s still humor. I particularly liked Spider-Man’s use of his cell phone. In once scene, he plays a game on his phone while waiting. In another, he sits atop a building in costume talking to his aunt about picking up groceries for her. As minor as it is to the story, it sets the mood quite well and is my favorite scene of the movie. To reiterate, things definitely weren’t all bad. I really enjoyed the film, and there were some excellent parts. Gwen Stacy wasn’t very important in Raimi’s films, and I didn’t really care about her. She’s portrayed and written well in the Amazing Spider-Man. She’s cute and a good love interest for Parker. It was a little odd that she dressed so provocatively at work, but she’s a teenager, so I suppose that’s realistic. It’s also odd that a high school teenager has time to intern at a large corporation, but I’ll accept that. Her father, Captain Stacy, was also an important role in the film. I enjoyed Parker’s interactions with him. I came into my viewing biased against it, so I was looking for problems. The Amazing Spider-Man was actually a fun superhero movie and has a lot of things going for it. Parker is a little less nerdy and a bit more angsty and angry. This is different, sure, but it works. Emma Stone’s portrayal of Gwen Stacy was great, and I’m happy to see her heavily featured. I’m looking forward to the sequel! This entry was posted in Comics, Movies and tagged andrew garfield, emma stone, film, marc webb, movie, review, sam raimi, spider-man, spiderman, the amazing spider-man, tobey maguire on February 17, 2013 by TheUser. Tales From the Clarke continues Scalzi wonderful episodic The Human Division. This time we see a familiar face from the first episode, Captain Coloma. Scalzi chooses a great protagonist by following a character with whom we’re already familiar but who was not a major character. She’s tasked with showing off an old ship to delegates from Earth. The Colonial Union wants to rebuild Earth’s trust, so this is a critical mission. However, everything isn’t as it seems. By the end we see some resolution but with more tantalizing questions to propel us into the remaining episodes of The Human Division. This entry was posted in Books and Literature and tagged book, ebook, episodic, john scalzi, novel, old man's war, review, sci-fi, science fiction, the human division on February 15, 2013 by TheUser. A Voice in the Wilderness is another side-story to the overall arc of The Human Division (and a great one at that). For the first time, Scalzi shows us what everyday life is like on Earth. Episode 4 follows a political commentator on Earth and shows us some of the conversations surrounding Earth’s relationships with the Colonial Union and the Conclave. It’s extremely fascinating and something we haven’t seen in the Old Man’s War universe previously. This episode provides great content for the current state of humanity in the universe. As might be expected by an episode still early in the total work, however, it also leaves us with questions. I’m anxious to find the answers to those questions in future episodes. A Voice in the Wilderness is easily worth the $0.99, and I’m thoroughly enjoying the episodic format of The Human Division! This entry was posted in Books and Literature and tagged a voice in the wilderness, books, john scalzi, novels, old man's war, review, science fiction, the human division on February 6, 2013 by TheUser.